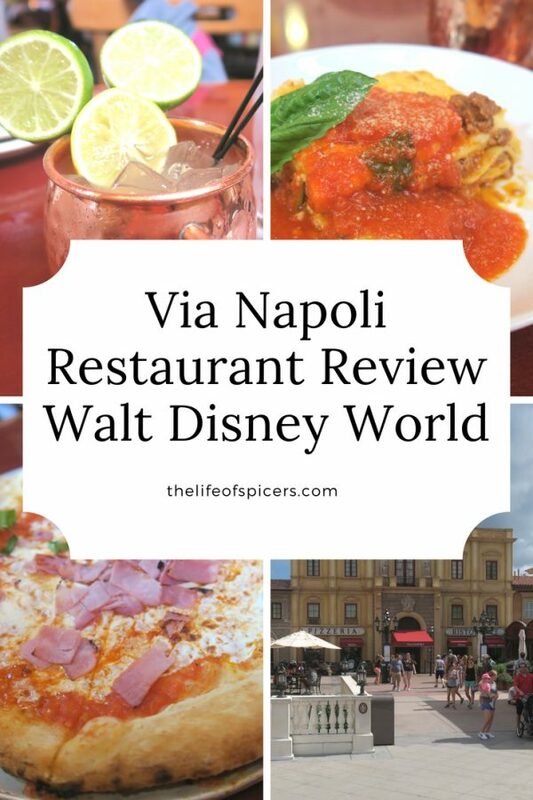 When we were booking our advanced dining reservations at 180 days earlier this year, I knew I wanted to book Via Napoli restaurant, one of the Italian restaurants in the Italian Pavilion at Epcot. As part of the dining plan, we were able to order a pizza, and dessert which was included. 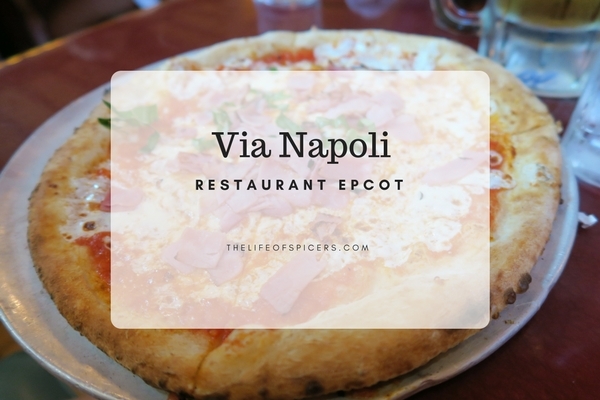 I knew pizza would be a welcome change within the holiday meals, as it’s not typically a meal we have when in Disney. Our meal was book for around half way through the holiday, and at 4.30pm. I wondered if it was going to be too early for dinner, but we adapted our daily plans to accommodate, knowing we were going to have plenty of food. Abby was never going to finish a whole pizza herself, despite it being classed as individual size. Via Napoli is very easy to spot in the Italian Pavilion, nestled at the back against some lovely buildings. The check in lobby is a little small and was very crowded, however the restaurant was on time and it wasn’t long before we were shown to our seats. The restaurant itself is a lot smaller than I had imagined, but the tables were placed very cleverly. We had a great place on the back wall where we could see the amazing pizza ovens. We had a lovely server who was very attentive throughout the whole meal, and we found this to be one of the better restaurants for service. We did have a discrepancy with the bill afterwards, however this wasn’t any fault of the server, so we overlooked it. 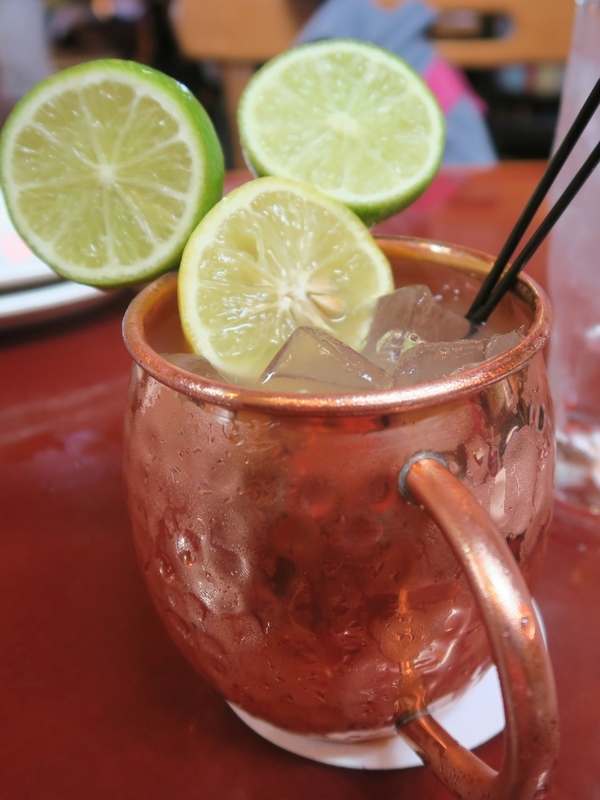 Starting with drinks, I opted for the Limoncello mule, at $15 it’s not a cheap drink, but it’s made very well and there was so much of it. I could barely finish it before the end of the meal. Alternatively the fountain drinks were included in our dining plan. Hubby and Abby opted for pizzas and I decided to have a change and order lasagne, mainly because the table next to us had just had it delivered and it looked really nice. I was also thinking that if Abby couldn’t eat the whole pizza then I would be able to try it as well. 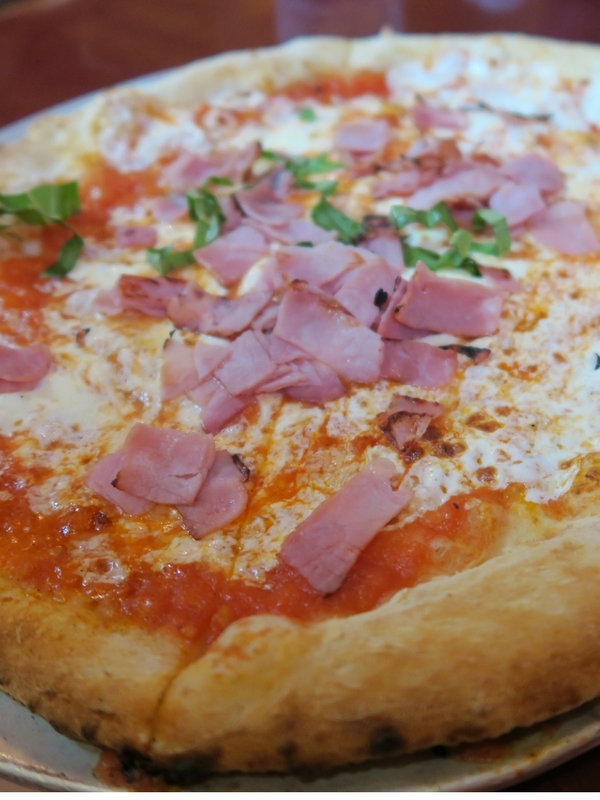 Abby decided she wanted to add extra ham to her pizza which was no problem at all, everything was easy to add to. The additional ham costs us $6 on our bill, but there was plenty of it. Hubby opted to have his margarita pizza as it came. Both said they were very tasty, and clean plates were left all round. Abby did a great job of trying to finish hers. As I had ordered lasagne, we were told at the ordering point that they would come out separately as they were from separate kitchens. This was fine with us but it did mean that our dinner arrived a little staggered, mine arriving first, so something to be aware of if you want your food arriving at the same time. My lasagne portion looked quite small, but wow I was so full by the end of it. It really was deceiving, as I was so full after dessert we had to take a stroll towards the Beach Club to walk off our meals. 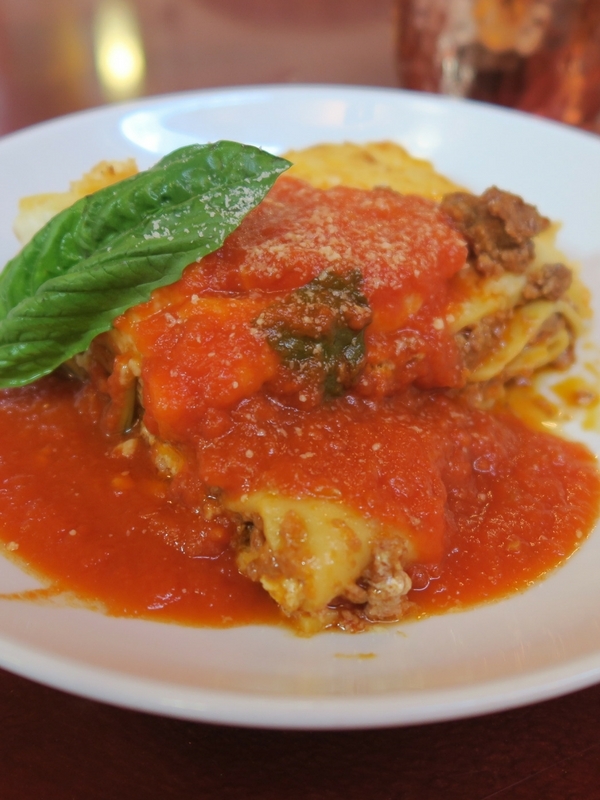 The lasagne itself was very nice, thick layers of pasta and a lot of cheese sauce with ample meat. Don’t let the size fool you. Dessert was included in our dining plan, so we all opted for ice cream that came out in a lovely sundae glass with a very fancy wafer on top. We were almost too full to eat them but gave them a great go. Via Napoli restaurant has a great light and airy feel to it. It was a little noisy but nothing over powering. We found the service to be great, the meals arrived quickly and cooked well. Had we been paying out of pocket for our meals I think it would have been a reasonably priced meal. A restaurant we would definitely return to. 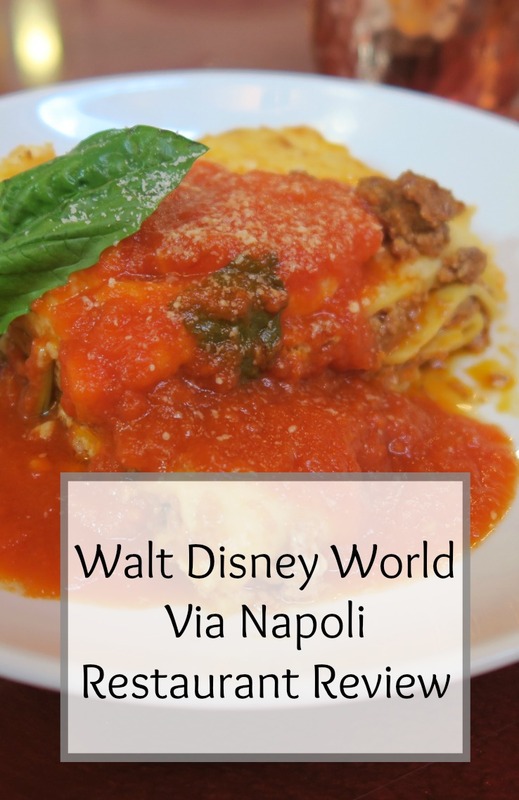 Other restaurants we have eaten at during this trip to Walt Disney World are Be Our Guest, Yak and Yeti, Crystal Palace, Rainforest Cafe, Trails End, Ohana, Hoop De Doo and Hollywood & Vine. I LOVE Via Napoli. Probably some of the best pizza I’ve ever had! I’m glad you had good service. The service here can sometimes be glacially slow.